I wasn’t long at Olivia’s house in Cork last weekend when I suggested to her that it was possible I may end up taking more photos of the flower girls Aoife and Niamh than I would of the bride, such was the energy and excitement that they were adding to the day! And as you can see in even this selection of images, they certainly featured heavily in my coverage of the day. Technically, given the presence of a Christmas tree at the hotel at least, this was my first Christmas wedding of six, and I almost had forgotten how much I love the light at this time of year, especially on a dry crisp winter’s day like we were gifted. 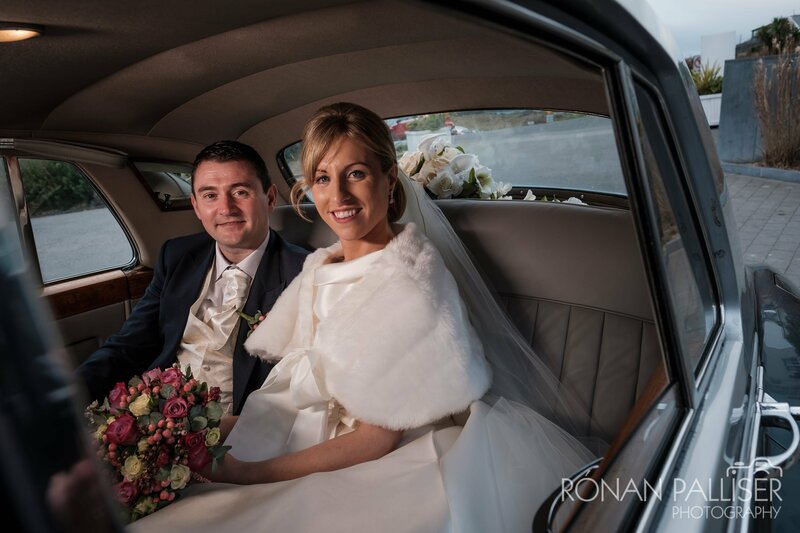 Of course the challenge with the light at this time of year is that it is short lived – by 4pm you’re really chasing the tail end of it – so it was welcome that Olivia and Darren had opted for a 12pm ceremony in the Honan Chapel in University College Cork​. Of course there are always compromises, and in this case the noon ceremony and the 30 minute drive from the house to the church made for an early start for everyone. It was lovely to work alongside Patricia and Anthony of Gaffey Productions​ for the first, and hopefully not the last time too – they captured moving images as I captured still ones. The locations for this wedding were close to my heart too – a ceremony at UCC and reception just outside Clonakilty reminds me of my own wedding day – this time the reception was at Inchydoney Island Lodge & Spa​ with its fabulous location on the Wild Atlantic Way​ – something I incorporated into a night time shot before leaving for the evening. UCC spoils for choice in terms of photos, especially on a dry day, and we couldn’t pass up the cheesy shot of Olivia and Darren posing with the cut-out graduates that we found hanging around the North Wing of the Quad. As I said – cheesy! The ceremony under Canon Leamy’s direction was lovely, and a highlight for me was watching the pageboys, shy at first about their walk up the aisle, change their tune once they realised the flower girls were stealing all the limelight, with an overtaking manoeuvre taking place half way along the aisle much to the enjoyment of guests. And if all of that wasn’t enough to like about this wedding, getting five minutes on the beach with Olivia and Darren before they joined the drinks reception was the icing on the cake. My Christmas wedding season has gotten off to a great start!